We are expanding the discussion of the Chinese five elements as a valuable approach to understanding symptoms, focusing on a different element each day with the corresponding chi gong exercises. Emotional Freedom Techniques (EFT) will be combined with imagery to address somatic metaphors in symbolic diseases and create new healing habits for health. One volunteer from the participants will be chosen each day for a demonstration of combined intuitive diagnosis and EFT/metaphorical imagery sessions. Each morning will begin with group dream interpretation based on the dream diaries kept by participants. The rest of the morning will be devoted to CHEC unit intuitive experiences featuring Hemi-Sync technology and voiceover guided imagery. In the afternoon participants will have the opportunity to practice their own intuitive diagnosis and EFT skills. The workshop is held in a small group setting of no more than 24, so sign up early to reserve your spot for this unique experience. Please join us for a fun and rewarding week. 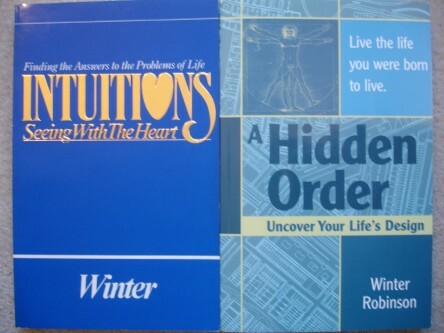 Winter Robinson, M.Ed., is internationally recognized as an author, teacher, consultant and medical intuitive, adept at facilitating the intuitive process, multi-sensory development and exploring human consciousness. She has also created a series of guided imagery CDs to help the listener reduce stress and deepen the alliance with the source of inner wisdom. A board-certified therapist who graduated from the University of Virginia (M.Ed. ), Winter began her career as a therapist at the Addiction Research Foundation (Toronto). She headed up a pilot study facilitating the art of medicine (medical intuition) to medical students at Brown University. For many years Winter was a TMI residential trainer and a research subject in the institute lab.